Like pretty much everything Congressman Joe Kennedy does, there’s a lot of thought behind his op-ed in STAT today. Kennedy explores how and why his thinking has changed on cannabis and he doesn’t dismiss the risks. And his comments touch a lot of the issues that have been discussed here on Village 14 and across Newton in recent months. Here’s a except but you really should read the whole piece. My reluctance to embrace legalization stems primarily from one place: my ongoing work with the mental health and addiction communities. I’ve seen the devastating effects of drugs that are used and abused. I’ve met family after family torn apart by addiction. And I’ve heard — repeatedly — from mental health advocates on the frontlines who have grave concerns about what access to marijuana might do for those prone to abuse. They worry about research showing marijuana can be addictive, particularly for adolescents. At the same time, I’ve heard from others who see marijuana quite differently. The parent whose epileptic child needs marijuana to calm her seizures. The veteran whose trauma it eases. The black teen arrested for smoking a joint while his white friends did the same with impunity. This exemplifies the problem with the Democrats. Lousy at leadership when it comes to social change. Great at jumping on a bandwagon. All aboard! It’s cute watching little Joey pretend to be a major-leaguer. I do wish you or your interns could have at least acknowledged some of the foreign-policy issues that I’ve contacted your office about, but I guess you were too busy philosophizing and waxing poetic about long-ago-decided issues like this one. Like pretty much everything Congressman Joe Kennedy does, there’s a lot of thought behind his op-ed in STAT today. Don’t you recognize satire, insofar as what Greg is stating about the Young Kennedy? @Mike: Clearly you believe that all our elected leaders — national and local — should have supported the legalization of cannabis from day one. But they didn’t and you’ve been exercising your right to criticize them ad nauseam ever since. But perhaps you ought to be celebrating the fact that their opinions are evolving. Why isn’t that preferable to them never changing their position? Fair question, Greg. I do not believe cannabis should have ever been criminalized in the first place. This country has wasted trillion$ in a war against a plant. The injustice of it all has been apparent for decades, while our elected “leaders” turned a blind eye. Cannabis reform has come to America through the ballot box. The people have spoken. I don’t give two hoots about some late-comer politician jumping on the bandwagon now. Kennedy is simply acknowledging the inevitable. @Mike: Kennedy is talking about federal legalization. The people have not “spoken” about that. I would think you would welcome that as a next step. 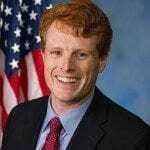 This is a pretty big reversal for Congressman Kennedy and I for one am grateful. I’m a big fan of our Congressman, and now I can cross one of my bigger disagreements with him off the list. I support federal legalization of cannabis. Not sure that’s the “next step.” At least not as long as the pharmaceutical industry owns half of congress. There’s never going to be a national ballot referendum on cannabis legalization. If there was, it would already be legal nationally. One state a a time will get us there. I’ll be honest. I’m pissed at politicians, and I’m in a throw-the-bums-out kinda mood. Look what just happened in Newton. Not a single elected official in the city stood up to defend the rights of a majority of voters. What a disgrace! Good. But how will the Congressman’s vision win support from the Senate Caucus of Trumpistan and Bible-Thumpistan? Please, no more jokes about sending Elizabeth Warren with a peace pipe. Mike-I did not attend the Nov. 19th city council meeting when the the zoning regulations ordinance that the Zoning and Planning committee passed 8-0 the week before was chartered and sent back to committee. However, my understanding is that just four councilors wanted the regulations sent back to Z and P for revisions and just one, Councilor Schwartz, chartered the item. I don’t think your characterization of the city council as a whole is accurate at this point in time. Most councilors want to pass the regulations that Planning Department recommended and Z and P voted out of committee and move on to work on other issues in the city. The Z and P committee spent many (painful) hours just last week reviewing the regulations with the Planning Department and (I think) the Law Department. Just one of the councilors who expressed objections attended this meeting, and that councilor left before the end of the discussion (I attended at that meeting). If they had serious concerns about the regulations, they could have and should have attended that meeting and gotten answers to their questions at that point. Don’t talk to me about how this is a part time job, yada yada yada. These councilors have now forced eight of their colleagues into spending yet more time on an issue that has a clear mandate from the voters. This is a part time job for those eight councilors as well. The actions of this small segment of the council indicate that they think they can force the Z and P committee into complying with their personal agendas, which is not what they were elected to do. The past is past and there’s no point in looking back when currently the majority of the council is ready to move on. @Mike: Although you said I raised a “fair quesiton” I still don’t believe you adequately addressed it. Yes, all the councilors supported the moratorium. But since then, several have really taken a leadership role in the effort to bring adult-use shops here and actively opposed the ban. Yes, I get that you wish they were all on board sooner. But if you’re unwilling to give them credit for their evolution, shouldn’t they at least benefit from less animus? I’m glad Joe Kennedy is coming around. It’s absurd that cannabis was ever listed federally as a Schedule 1 drug (high potential for addiction, zero medical benefit) alongside heroin — a stricter schedule than PCP, fentanyl, cocaine, MDMA and methamphetamines. That cynical, politically motivated anachronism is a holdover of the 1970s Nixon administration. @Greg– You want me to tone it down? Seriously? The Mayor and a group of City Councilors tried to steal an election, and you think I should play nice with them? Keep history in mind. Many of these elected “leaders” also voted to ban MEDICAL marijuana. That action is why there is still only one dispensary in Newton 6 years after voters legalized it. The voters were stymied again after legalizing recreational cannabis in 2016, only to have their entire slate of local representatives try to erase that vote by passing a moratorium without a single dissenting vote. Like a majority of Newton voters I voted to legalize recreational cannabis in 2016. Can you name one elected official in Newton who defended my vote? I voted to legalize recreational cannabis in 2016. Can you name one elected official in Newton who defended my vote? Yes, I can. The biggest threat to recreational marijuana in Newton was the Opt-Out referendum. Councilors Albright and Krinzman worked in opposition to that from the time it first surfaced. They both have taken a huge amount of grief over that position and the OptOut folks have vowed to work strenuously against their re-election. I for one give them huge credit for sticking to their position despite the public brickbats hurled their way. As a very outspoken proponent of legalized marijuana I’m amazed that you’re tarring all the councilors with the same broad brush on this issue. One of my ongoing frustrations with how City Government tends to work is that a small number of very vocal people tend to be able to sway many of the Councilors on a range of issues, even when its clear that the majority of (quieter) citizens are on the other side of an issue. In this case, Ciuncilors Albright and Krinzman were the two who most clearly were the voices on the council who “defended you vote” and I’m amazed that you are so reluctant to at least grudgingly acknowledge that. And no @Mike, I’m not asking you to tone it down (we both know that’ll never happen) but I do think you should not dismiss all of our electeds with the same broad brush. Why engage in arguing political points if you’re forever going to berate folks who eventually agree with you but didn’t do so on your preferred timeline? Or if you need a sports analogy, I didn’t care much for Kyrie Irving when when was feeding the ball to LeBron But he’s on my team now and I’m thrilled to have him. Joe Kennedy wrote a very compelling column acknowledging his reservations as well as the reasons his position has evolved. Isn’t that exactly what you want to happen with anyone who doesn’t see eye to eye with you? @Jerry– I understand why Councilors Albright and Krintzman fashioned their compromise. You’ll recall that I objected to it from the beginning, and [as Greg put it] “ad nauseum” throughout the run up to this month’s vote. You may think that opt out posed the biggest threat to cannabis rights, but in my opinion opt out never had a chance. In fact, the compromise proposal had a better chance of success than opt out. But the compromise did not respect the 2016 vote, so [along with most Newton voters] I did not support it. I’ll repeat my point… Of the 25 elected officials responsible for implementing the 2016 law in Newton, not a single one of them defended or protected my vote. I may not have the best short-term memory in the world, but I’m never going to forget how little respect these “leaders” had for me or the rest of the electorate. Full national legalization is far preferable to maintaining the status quo. If nothing else it will enable the Federal Government to regulate and tax the sale and distribution of marijuana and begin to begin systematic research into the real health effects of this drug. At present, the Feds won’t conduct the needed research because marijuana is still a Class 1 Controlled substance. This is totally insane. I’m not upset that Joe Kennedy came to see this later than Bernie did. I’m just glad that he did. I hope it means he thinks this is an idea whose time as come. As such, he’s a very important political leader to have on the side of common sense.